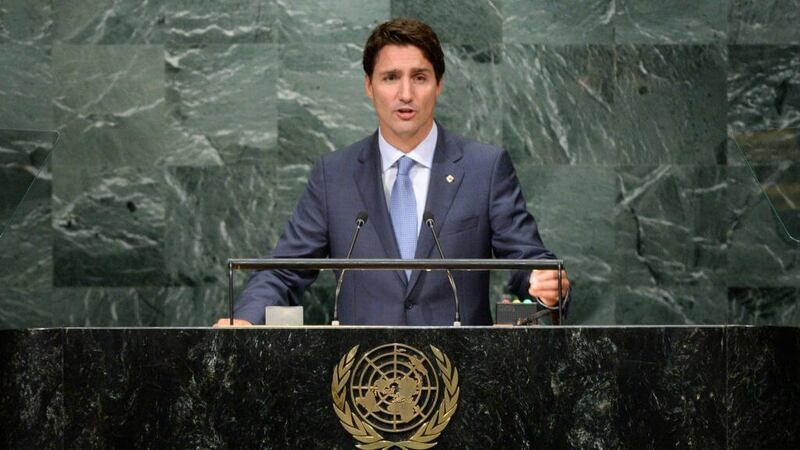 Trudeau addresses the U.N. General Assembly in 2016. Photo courtesy of YouTube. Since taking office, Trudeau has been astute at bringing the politics of personality and appearance to the fore, a smiling face making overtures toward progressivism as his party upholds many of the policies their voters were spurning. His approach since Donald Trump’s election as U.S. president has been one of conciliation, even on matters that an optimist might expect our government to take seriously. For one, instead of taking a principled, perhaps risky stand and repealing the Safe Third Country Agreement, allowing refugees who have touched ground in the U.S. to seek safe harbour in Canada, Trudeau sent a tweet that implied any refugee turned away from the U.S. would find a home in Canada; this was soon revealed not to be the case. Similarly, a recent “feminist foreign policy” was received with much fanfare despite promising little in the way of new funding. It remains to be seen what kind of positive impact, if any, Trudeau’s ostensible feminism will have on the global stage. The Liberal party’s election was heralded as a return to Canada’s longtime domain of “soft power,” a retreat from the Harper Conservatives’ efforts to make Canada a hard-nosed military power. In the intervening two years, the government has failed to extricate itself from its role in the Middle East, is participating in NATO efforts to amass troops on the Russian border, and has announced it intends an expansion of the military budget by dozens of billions of dollars. Paradoxically, the latter development was framed as a stand against Trump, despite playing into one of the president’s few demands: NATO allies increasing their military spending. This is the Liberals’ diplomacy under Trudeau in a nutshell: They are a bulwark of the worst impulses of liberalism and capitalism, and effect superficial dedication to social justice issues in an effort to mask their less-than-savoury endeavours—such as a fierce commitment to the type of free trade that has contributed to unfettered, destabilizing globalization in the past 30 years. Frustration with that economic order is evident in the surging populist anger on both the left and the right across the Western world, yet the Trudeau Liberals remain committed to the false idols of free markets and voracious capitalism. When the message and substance of his politics are in conflict, Trudeau has managed to talk out of both sides of his mouth. He’s been lauded for speaking strongly in favour of fighting climate change. But more than one year after the landmark 2015 Paris climate agreement, he announced the approval of two new oil pipelines. Inexplicably, he claimed that further developing the oil sands was necessary to fight climate change. It’s a rhetorical manoeuvre for which Harper would have been laughed out of the room. Yet in a world facing imminent, potentially catastrophic climate change, and where conflicts leave millions displaced and in search of a safe home, it’s hard to see that merely showing up to the table is enough. Trudeau and his government may feel “absolute joy” at participating in the processes of global governance, but what does that mean to anyone outside the halls of power? Approaching diplomacy as a bracing, high-stakes game can only end in disaster for someone, and it’s usually people who don’t have that same luxury. Mistaking a tonal shift for substantive superiority is a grave miscalculation. Trudeau’s Liberal party seems to have bought its own hype.